We offer premium bouncy castle hire in Perth. We have high quality bouncy castles and slides with unrivalled customer service. If you appreciate your calls and emails being answered quickly and your hire delivered on time then you are in the right place. We believe we have the highest standards with in our industry and strive to make your hire a pleasure and stress free. We are a family run business and have our own children. We believe your child’s safety should be our primary focus, that’s what we would expect! Our castles have completely open fronts for a reason. Not only can you take photos whilst the kids are having fun, you can easily supervise them while they play. Our smaller castles were specifically chosen to fit in back yards saving you the cost of hiring halls or using parks. If you want your party in a hall or park we can obviously accommodate that also. All Love Bouncy Castles staff are Nationally Police checked. Staff that supervise events are also working with children approved and hold WWC cards. We train you to use the equipment. Fire extinguishers are supplied with every hire. Crash mats are supplied with every hire. Our castles are fully checked, installed and inflated before we leave. We offer free factor 50 sunscreen for children during the summer months. Love Bouncy Castles prides itself on safety and continually searches for improvements. All Love Bouncy Castle Staff are nationally police checked. Staff supervising events are working with children checked and hold a working with children card. Our castles are fully certified and inspected by a qualified engineer every 12 months. As required by law, some of our castles are registered with Worksafe WA. Love Bouncy Castles holds public liability insurance for $10,000,000. A copy of our certificate is available to all customers. Most councils require a copy prior to approving an application for inflatables to be used in public areas. All Love Bouncy Castles come with an Electrical Safety cut off switch (RCD) in case of any incidents. Our electrical equipment is tagged and tested every three months. For anchoring the inflatables, we use pegs that exceed the minimum safety standards. We also use pegs that are specifically designed for loose soil and sand that are rated to 180kg per anchor. During installation, our staff conduct daily safety checks on all our equipment. This ensures the Bouncy Castle is in perfect condition for you prior to use. Cleaning and disinfecting the bouncy castles and equipment. All our bouncy castles will be cleaned prior to use. We make sure that the bouncy castle is clean and tidy before we leave your home. All the castles and safety matts are cleaned with a high grade multi purpose cleaner before every hire. We also regular disinfect the bouncy castles to keep them as clean and hygenic as possible. No one wants an old warn out dirty bouncy castle delivered for their party or event. All of our equipment is less than 18 months old so its as good as new. Inflatables should not be used in excessively wet and windy weather conditions. Our bouncy castles have built in rain covers that will protect you from a light shower and also protect from the sun’s harmful rays. We do not install bouncy castles in the wind and rain. If the forecast is bad or if it’s raining on the day of your booking we will contact you and check if the party is still going ahead. If bad weather is forecast and the conditions for the hire are dangerous we will cancel the booking. Likewise, if you decide to cancel your booking because of the weather a full refund will be made.If it does rain during the hire, we advise all customers to stop using the castle until the rain has stopped and the bouncy castle is dry. Your safety is our priority but it is also your responsibility. Children MUST to be supervised at all times during the hire. 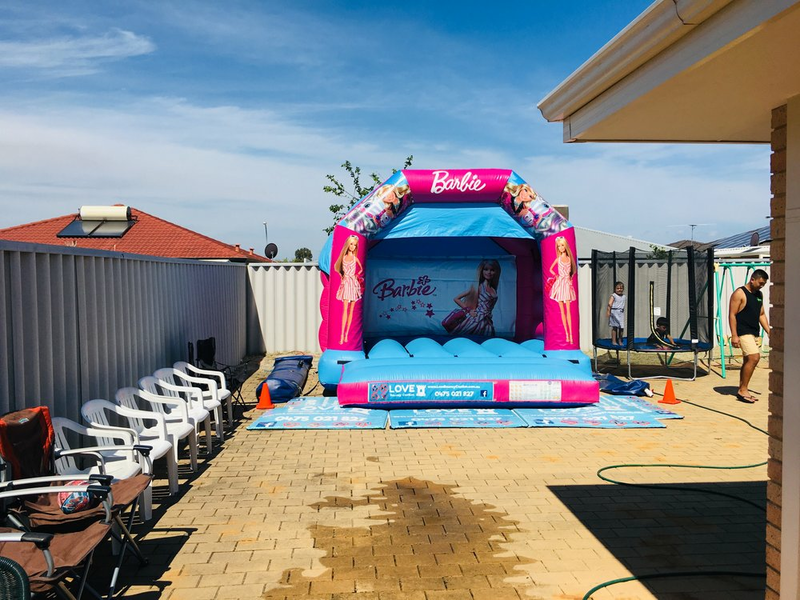 When the inflatable is installed you will be trained by a member of Love Bouncy Castles on how to use the equipment and supervise it during the hire. A supervisor is required to be physically present at all times. For Events being held in public places like fairs and fates require a Love Bouncy Castles operator to supervise the event. For private functions held in public such as birthday parties in parks, these can be supervised by yourself. Can Bouncy Castles Go On Concrete ? The answer is Yes. Bouncy castles can go on all hard surfaces as long as you have two things. Added protection under the bouncy castle like a thick tarps and sometimes extra matting just to give the base of the castle that extra protection. The last thing a customer wants is a repair bill so we go the extra mile to make sure that won’t happen. The second thing that is required on a hard surface like concrete is 1000kg in weight to anchor the bouncy castle to the ground. On a grass surface we can you spikes / pegs to anchor the castle to the ground. On hard surfaces like concrete, pavers and bitumen this is not possible so we need to use weight in the form of sand bags or water anchors. these sand bags and water anchors are connected to the bouncy castle strapping with carabinas. Most customers don’t realise how many sand bags you require around a bouncy castle to make it safe. Have a guess ! 4, 8, 10 ?? Nope you need 40 sand bags at 25kg each. YES that what I said 40 ( FOUR ZERO ) 40 x 25kg = 1000kg. The next time someone turns up with 4 sand bags do not let your children on the castle as its only 10% of the legal requirement. This will be putting your children at RISK in high winds. Do not except anything less than the legal requirement. This is the legal requirement regardless of the expected weather conditions for your party day. As an example if the weather was forecast for sun and no wind at all the 1000kg anchorage weight still applies. as we all know too well in Perth the weather can change in the space of 10 mins especially the wind. The other alternative to sand bags is Water anchors. These water anchors are like an inflatable sausage that we will fill water from a hose. These water anchors hold over 700 litres of water each so one on each side of the castle more than exceeds 100kg in weight. Bouncy castles are very safe as long as they are secured in the correct way and the safety guide lines are followed. If you would like a bouncy castle put up in a safe manor to keep your children and guests safe please give us a call. Safe working guide lines for wind speed is below 40kph or 25mph. Any speed exceeding this the bouncy castles must be vacated by all occupants and switched off until the high winds passes. How to tell if the wind speed is too high ? 3 ways to tell if the wind speed is too high. 1- Check a local weather report for your area. 2- If tall trees are listing over in any direction then this is a great indicator that the wind speed is too high and above 40kph. 3- The front A frame arch on the bouncy castles will warp and distort in the wind (change shape) This is also a very good indicator that its time to turn the bouncy castle or slide off until the wind speed drops to a safe level. If you are still unsure then you can call us 24/7 on 0475021827.